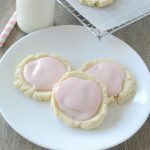 This copycat Swig Sugar Cookie recipe is the perfect pressed sugar cookie with a sweet tangy frosting made with sour cream. It’s the sugar cookie of your dreams! 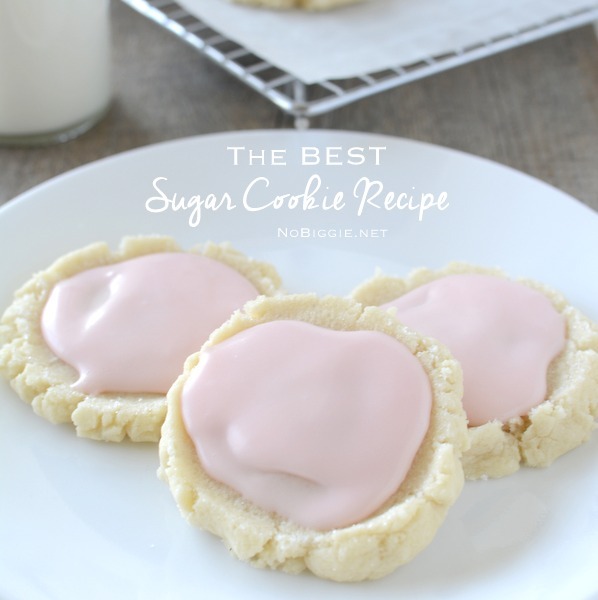 Everyone needs a good go to sugar cookie recipe, and this is it. If you live in Utah, then you’ve probably tried the amazing Swig Drive Through Stop sugar cookie, they’re the best! If you don’t live in Utah (or even if you do), you’ll want to make these at home and share with your family and friends, they’ll love you forever! Because I love a good cost breakdown. At Swig the cookies cost $1.60. The cookies at Swig are bigger in size than the size of cookies we’re making here, but if you make them at home, you can make about 4 dozen cookies for the cost of 4 cookies at Swig. Plus they’re meant to be kept refrigerated and they freeze great too, so you can share right away, or stow away for a special occasion, like a party or a baby shower. Do you store your butter in the freezer? I do, especially when I buy it in bulk. So if you’re like me, you’ll need to allow that rock hard frozen butter to come to room temperature. 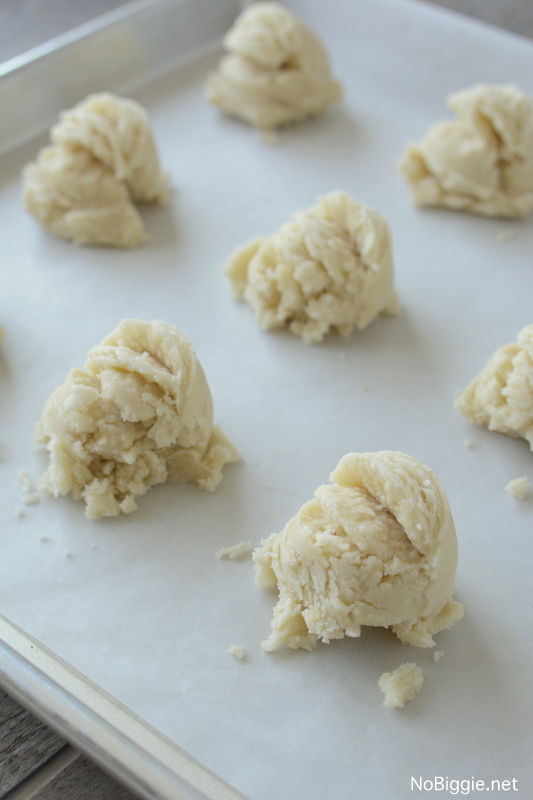 So if you want to make these cookies today…(you do, you really do! ), go ahead and get three sticks of butter out of the freezer right now. 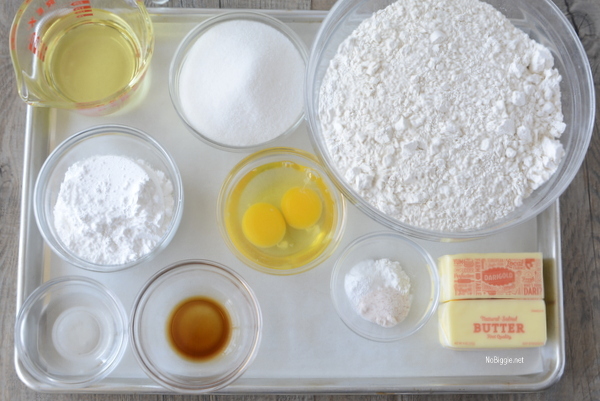 Here’s a look at all the ingredients all in one place…”mise en place” as the french like to call it: meaning to get all your measured and prepared ingredients ready before you start cooking or in this case baking. I love doing this. This recipe calls for room temperature eggs, but my eggs are always ice cold in the fridge. 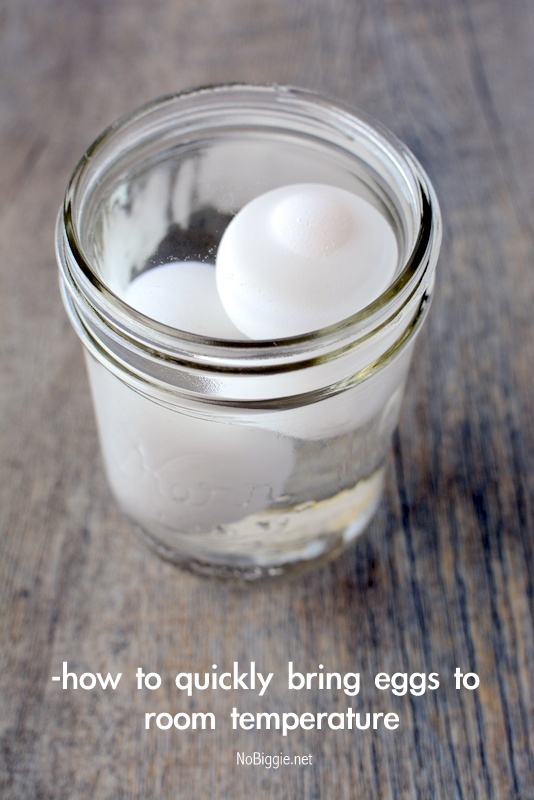 Here’s a quick tip for bringing eggs to room temp quickly: drop them into a glass jar filled with hot water from the tap. Let them sit in the water while you measure and prep all your other ingredients until you need them. 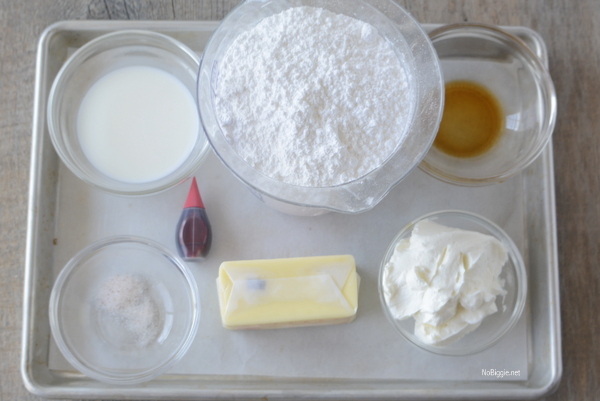 Preheat oven to 350 degrees F. In a mixing bowl whisk and sift together flour, salt, baking soda, and cream of tarter. Set aside. 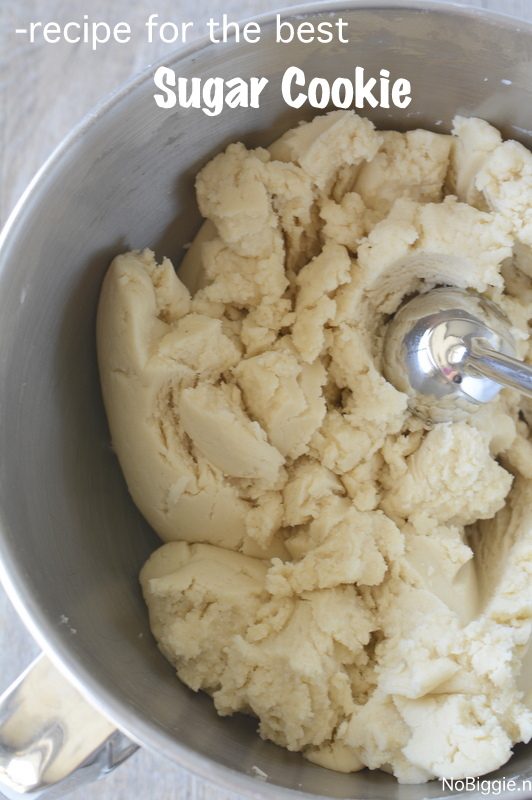 In the bowl of a standing mixer, cream together the butter and sugars for 2 minutes. Slowly stream in the oil while beating. Add the water and vanilla and then beat the eggs in one at a time until combined. Now add the dry ingredients to the wet ingredients a little at a time, mixing until combined (scrape down the sides of the bowl as needed). Using a 1 1/2inch ice cream scoop, scoop out the cookie dough into uniform sized scoops onto a parchment lined baking sheet pan. 12 cookies per pan. With this size of ice cream scoop, you can get about 40 to 48 cookies from this recipe. Place 2 tablespoons sugar in a small dish with a pinch of salt, use more if needed. Take a drinking glass or something about 2 inches in diameter (I used an empty Star Bucks frappuchino glass…you know the kind shaped like an old fashioned milk glass?…it worked great!). Dip it into the sugar (you may need to press the glass into the first cookie dough scoop to grease it up for the sugar to stick to the glass). 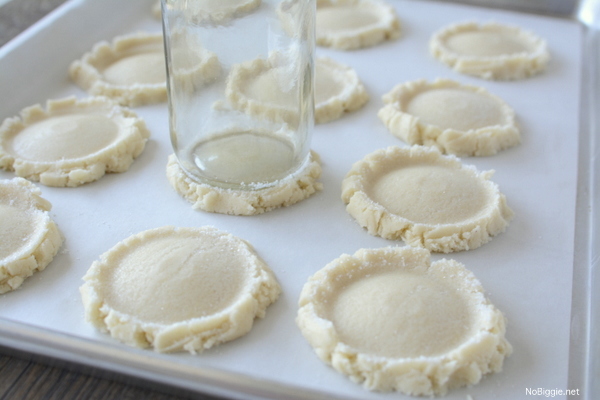 Press the glass into the cookie dough scoops to form a jagged edge around the cookie. The dough will spill past the edge of the glass. You might need to use your fingers to press pieces of the dough back into the cookie. 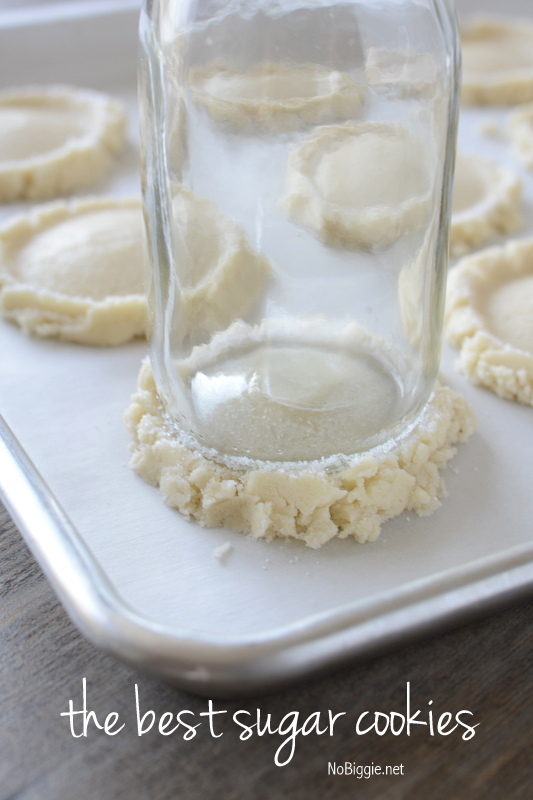 Repeat this process of dipping the glass into the sugar and pressing it into each scoop of sugar cookie dough. Bake the cookies for only 8 minutes. You don’t want to over bake. Let them cool right on the pan. Cream the butter, sour cream, and salt together. Add powdered sugar a little at a time, alternating with adding the milk. Add extra milk or powdered sugar if needed to reach your desired consistency. Add food coloring and vanilla and mix until combined. Using a rubber spatular add a big dollop of icing onto each cookie. With the backside of a spoon, spread the icing over the center circle of the cookie. Let the icing dry and set to the touch and then store in an air-tight container in the fridge. Store cookies in a 9×13 glass pyrex dish with plastic wrap over the top and parchment sheets between the stacked cookies. 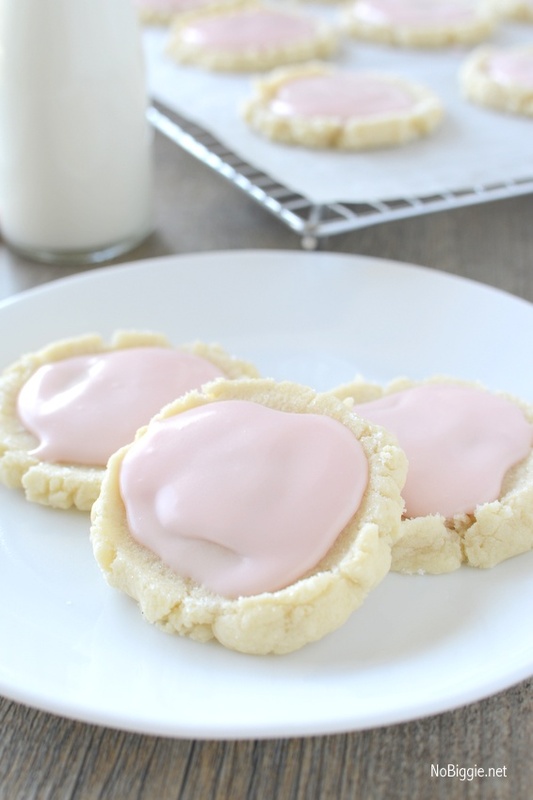 These cookies are served chilled because of the sour cream in the pink frosting. We recently made this great video to show you how easy they are to make at home! *Update – If you are not up for making these from scratch…Good News! 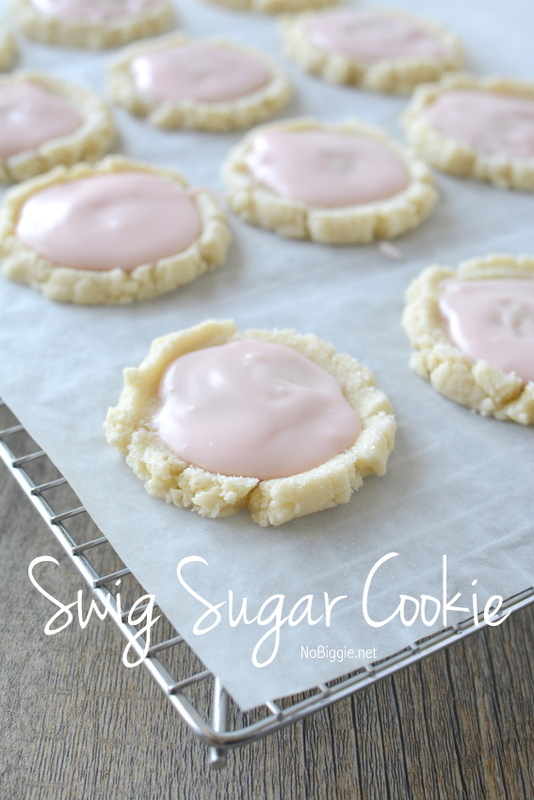 You can now buy the Swig Sugar Cookie Mix! The ice cream scoop is such a time saver! 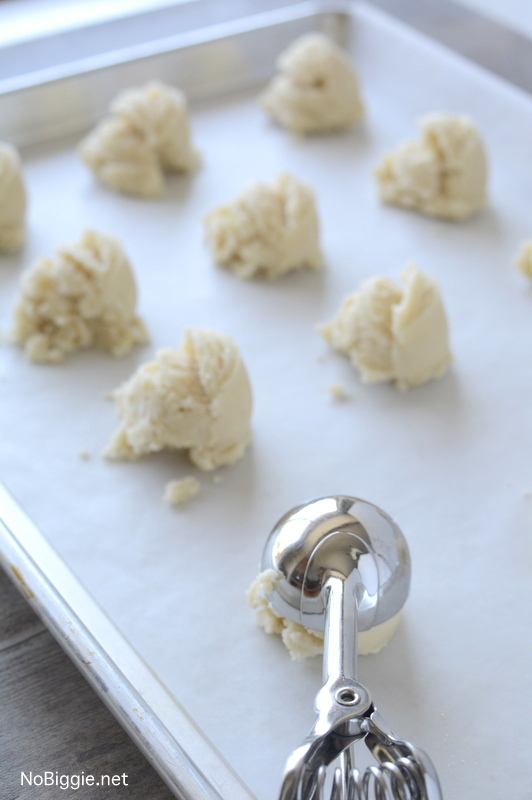 Don’t worry…those little cookie dough pieces will get pressed back into the cookie. This empty Star Bucks glass is the perfect 2-inch diameter for each cookie. 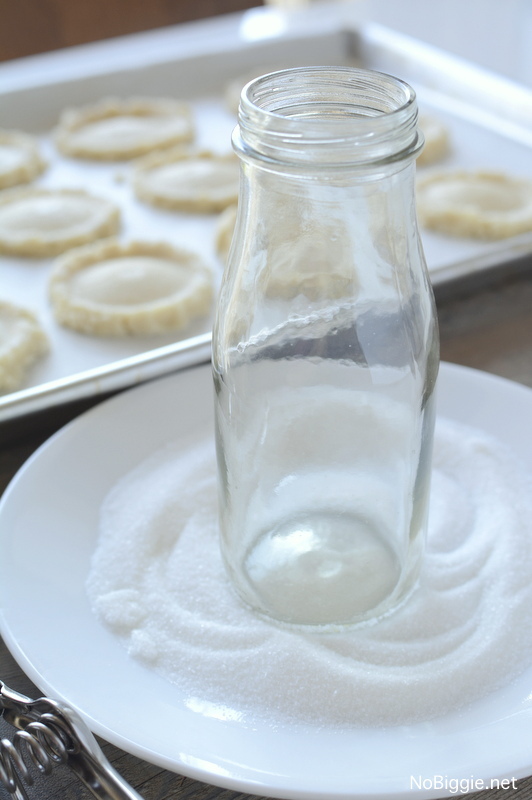 Now press the glass into each cookie, leaving the sugar crystals around that jagged edge. Here’s when you can press the pieces of dough back into the cookie. 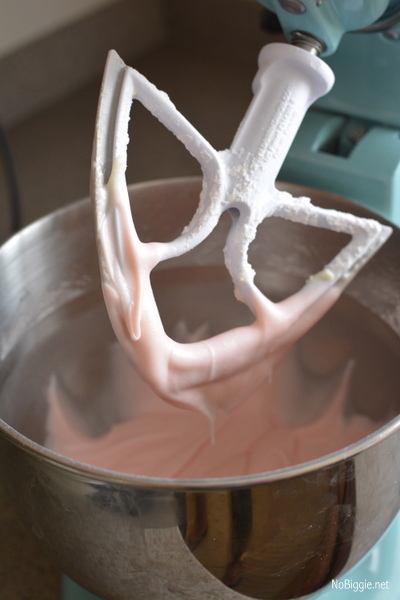 While the cookies cool, you can mix up the pink icing. Gather all the ingredients…this is also a great way to make sure you have everything you need before you start. The sour cream in this icing/pink frosting makes it taste so good! If you do use a cooling rack, these parchment sheets are nice for moving all the cookies over to the cooling rack at once! I hope you make them! They taste great cold with a big glass of milk! Recipe Adapted from Vintage Revivals and Garnish and Glaze. Definitely going to try to make these. My kids love both Swig and Slurp, they will go crazy for these cookies at home. Thanks for the recipe! I’m going to make these and take to a barbecue at the beach. Think I will use blue coloring…….like the water. it would be nice if you had someway to print out the recipes from the page…they sound awesome and I will make these…just wish I could print out just the recipe. Hi Pat! I used to offer an easy print option, but I was worried it wasn’t always reliable. For now just copy and paste. Or just visit the recipe from your device when you need it. I hope that helps. These are really good but my dough is so dry it just crumbles and doesn’t work pushing them down in the middle. What can I add to make it more dough like without ruining them? Hi Addie – Oh shoot! Maybe you could try a teaspoon or up to a tablespoon of water. Sometimes water can act like egg white. See if that could help. Or maybe you need to press them together with your fingers more. When you use an ice cream scoop, they don’t hold together as well as when you roll them into a ball with your fingers, it’s just more time consuming, that’s why I prefer the ice cream scoop. I live in N. Utah, which is a high mtn desert….if I don’t keep my flour in a sealed container it dries out & that definitely changes the texture of things….cakes too dry, etc. Hello! These cookies sound great – I was wondering if the recipe still works with unsalted butter. Do any ingredient adjustments need to be made? I’m trying to watch my salt intake, and salted butter is sometimes inconsistent as far as salt levels go. Thanks! I’m curious if anybody has any experience making these ahead of time and freezing them? I am helping with a wedding and these cookies are a must but I am hoping to take some of the pressure off by making them before! Yes you can freeze them! They will freeze great! Do you freeze with the icing on the cookies or just freeze the cookies and frost when you are ready to use? You could freeze them with the frosting or for looks freeze it separately. Can you make a big cookie cake with this recipe? Or is it better in the smaller size? I’m so excited to make these! I love sugar cookies; but I hate rolling out the dough. It makes a floury mess! These will be perfect and they seem easy enough that my 4 year old can help (she LOVES to bake). The picture looks like they are soft and chewy, are they? Gonna have to freeze half of them so I don’t wander into the kitchen and eat them all! Thanks for the recipe! 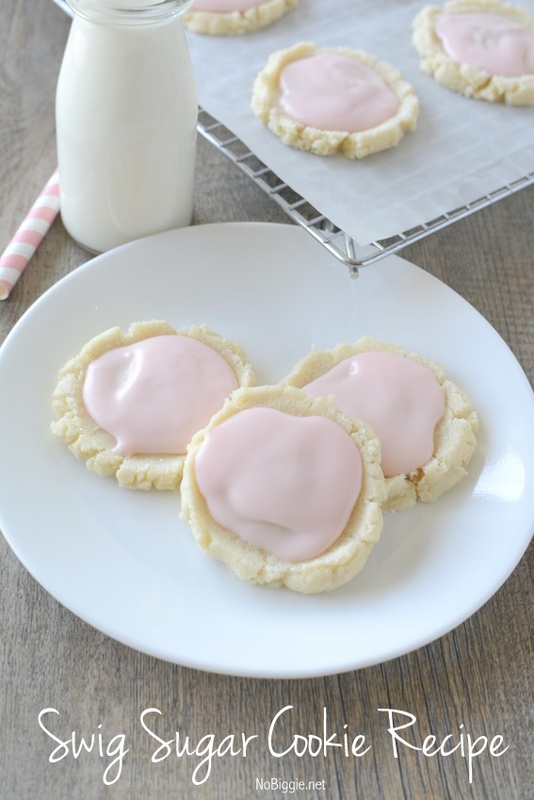 We absolutely love the swig cookies, and so we had to try the recipe. And it was a total hit! Tasted just like them! Do you freeze after the icing is on the cookies or just freeze the cookies and frost when you pull them out to use? What oven temp to cook sugar cookies?? It’s 350 degrees – it’s on the recipe instructions. I have never tried Swig Cookies before. I have been wanting to try out a new cookie recipe, so I came across this recipe on your site. It sounded intriguing, so I thought I would give it a try. Wow!! They turned out great! I followed the recipe to the letter (including using my 1 and 1/2 inch cookie scoop) and the recipe made 60 heavenly cookies! Just to give you an idea of the size the cookies are when squished down with a glass, my cookies measured about 3 and 1/4 inches diameter. I can’t wait to pass these along to those I baked them for. Thank you! this recipe looks like just what I have been looking for. But, I am wondering if I could make different flavor cookies. (you see I got carried away this summer on a favorite baking supply website and I bought many different flavor extracts, besides the vanilla. I have lemon, maple, butter rum, almond, and one more I can’t remember the flavor right now. Could I replace the teaspoon vanilla with any of these flavors. I’m thinking of a batch of each, then put all flavors in a cookie gift box for friends and family. I have been making these cookies for years but mine are called Amish Cookies. They are very addictive! I have never kept them in the fridge though. At Christmas I use cookie stamps to squish them down and have snowflakes! Wondering if the flour was all purpose or self rising? Assuming all purpose due to the baking soda being added. I’m so excited to try these things!! Yummmm!! I’m trying to get ahead this year and make a bunch of cookies and freeze them so I can just do the baking a couple of days before Christmas. Do you think it would be better to bake these and then freeze them or to freeze the dough unbaked? Big hit! Thank you for the great recipe! I made these 3 times and followed the recipe by the letter. I am not complaining as they taste good…but they do not look like this. Even though I used a 1 1/2 inch scoop and felt like I was using the exact same amount for each cookie, they each turned out fairly different looking. The seem (and look) more dense than yours. Some turned slightly brown on the bottom and some did not, and either way they had the denseness. My first thought was that I overcooked them, but the ones that definitely aren’t overcooked are still not like yours. And then the frosting looks more airy and fluffy than yours. Is that over mixing? Any idea what I could be doing wrong to make a dense cookie? I REALLY want to perfect these. Will this recipe work for rolling and cutting Christmas cookies? Thanks! Hi Jolynne – there are two room temperature eggs. I see them in the list of ingredients, now. Can the filling for these cookies be jam? These cookies were dry and bland. I had a nibble of cookies dough and thought how dry they were. The amount of flour to sugar ratio seems so off. Once the cookies were made my whole family could taste the flour. Just a hint of the flour but there. The frosting is the only saving grace for these cookies and I piled them high so cut the dryness. Hi there! Thank you for the recipe! Will the icing stays soft or will it harden? The icing stays pretty soft, just make sure to keep the cookies cold and in an air tight container in the fridge.